I received two different flavours of Jaxx chocolate crunchies. Firmly aimed at a younger audience, these chocolates are more quick snack than fine cocoa coture. 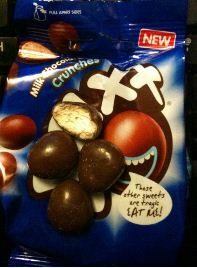 The first I tried was the blue bag of milk chocolate coated crunchies. While they were far too sweet for me, these will hit the right spot with kids I’m sure. Combining wheat-based cookie-type centre with thick chocolate coating you can see that these small chunks of sugary treats are going to be winners with kids. 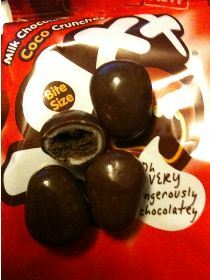 The next bag I tried was the milk chocolate covered cocoa crunchies. These have a cocoa cookie centre, with a white chocolate and milk chocolate coating. While again extremely sweet I’m certain that the target demographic is going to love them for being sweet, chocolaty and cookie-based. The website is awfully cute and it is just a lot of fun. I think kids are going to get a kick out of these but they were just a bit too sweet for me.